Hi guys ! Hows everyone’s weekend going ? If you’re having a typical Saturday, battling a hangover like I am, I feel you. What is your hangover dealing routine ? Is it a shower, a workout, a giant cup of coffee ? My standard go-to hangover routine is French fries and coffee, arguably a strange combination but somehow it does the trick. Anyway, today I swapped the French fry ritual with a giant slice of red velvet cake, and it was like comfort on a plate. If comfort was red and slathered with cream cheese. 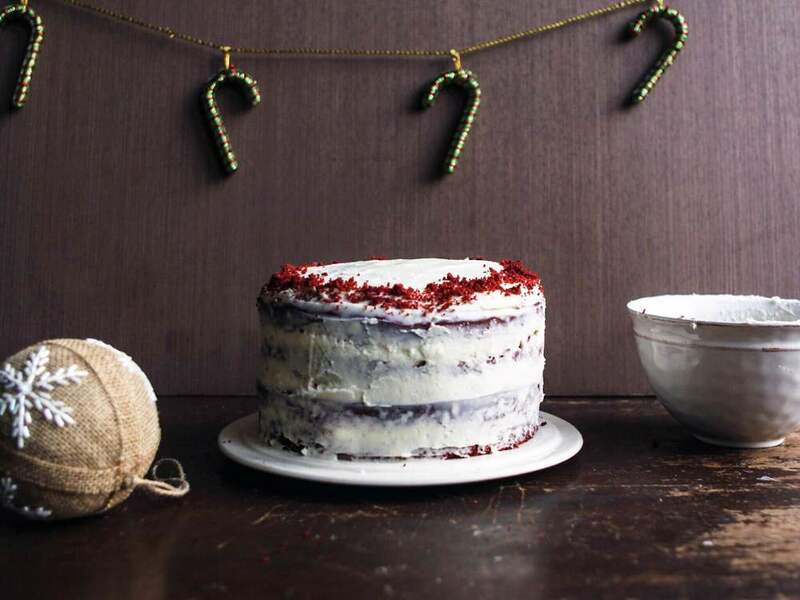 I’ve been making red velvet cake for a while now, way before I started really baking and thought there was something cool about it. But the truth about red velvet is that its just a light cocoa sponge with red food colouring. But but but, sandwich some cream cheese frosting between the layers and you have yourself a pretty delicious cake! Also, I recommend a layer of frosting for every half inch layer of cake. In this particular cake, frosting is everything, and for it to be the really delicious creamy, soft spongy cake that you imagine it to be, the frosting to cake ratio needs to be perfect. So I make 2 layers in 2 separate cake pans and then slice each layer into half, making it a 4 layer cake. So that increases the surface area for the frosting so it can be really generously put into the cake. Okay im done being scientific/mathematical about things, I had a moment of nerdiness and its over now. Preheat oven to 180˚ C. Butter two 8 inch round cake pans and line the with parchment paper (Very important!) . Set aside. In a bowl sift the flour, salt, and cocoa powder, baking powder and baking soda. Set aside. In another bowl, beat the butter and sugar until light and fluffy (about 3 minutes), using an electric mixer. The mix should now look pale yellow, almost white. Add the eggs, one at a time and beat. Add the vanilla extract and beat until combined. Scrape down the sides with a spatula. In a small cup combine the vinegar and baking soda. It will fizz a little. Add to the cake mixture and immediately fold. Divide the batter evenly between the two cake tins. Bake for approximately 30 minutes or until a cake tester inserted into the center comes out clean. Let the cakes cool at room temperature and then wrap in cling plastic and refrigerate the layers for about 30 minutes. Meanwhile, get on the frosting. Cut the Philadelphia Cream Cheese and butter into cubes and whisk using an electric mixer. Add the icing sugar spoon by spoon, whisking throughout. Slice each cake layer in half, down the middle, using a serrated knife, so you now have 4 equal layers. Generously frost the first layer with the cream cheese frosting and neatly place the next layer on top. Repeat. When all layers are frosted, frost the top and sides with a thin layer of icing. Then refrigerate the cake for about 15 minutes. Lastly, take out the cake from the fridge, and use all the leftover frosting to frost the rest of the cake.Dust with red cake crumbs.